Topics useful for the programming assignment. Today’s class will focus on topics for the programming assignment. Your professor will not be presenting any/many new topics. If you need help or advice, you will get it there. The Mac-equipped lab rooms have classes at the same time as our class. So, depending on demand, we can move to the library (learning commons) if we need to. Sample resource paths include teams, players, and so on. Use the JSON Formatter & Validator to inspect the results. The digit “1” is the host (web service) unique object identifier. In the next few days, starter data will be loaded for Team and Player entities. There will be 24 teams (from the AHL, the American Hockey League). Your professor plans to assign each student a team. As previously noted, you will load the data when the app launches for the first time on a device. OK… we have talked about a scenario where one single controller would work for both add and edit situations. Players, equipment items, whatever. The incoming object could be a custom NSManagedObject subclass (common) or an NSDictionary (less common). However, if the controller’s being used to edit an existing custom NSManagedObject subclass object, then we need to think about this differently. In class, we discussed what happens when you use the list of players. Your app should already have this functionality. The following is new. Please note that you should design this functionality by thinking about it and sketching it out, before you begin coding. That will help you understand what you want to do. After additional thought and coding, your professor recommends that you create a separate scene and controller for each equipment category. Why? 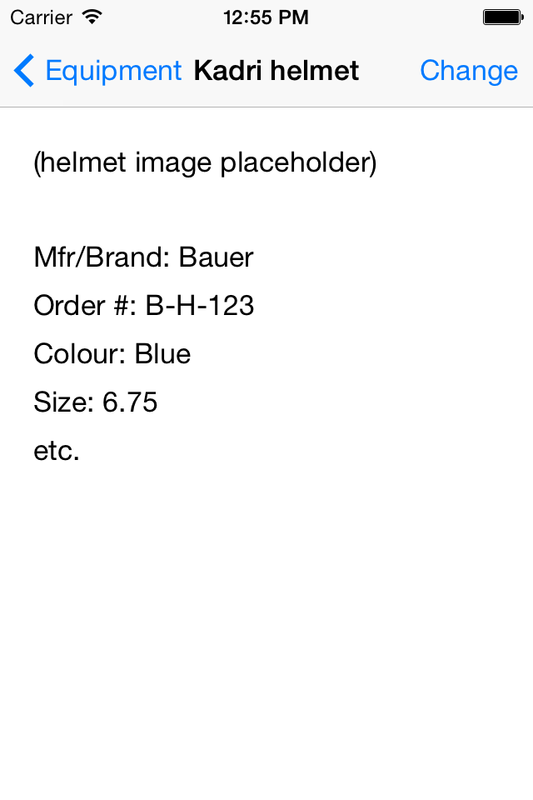 In the following instructions, we’ll focus on the ‘helmet’ equipment category. The approach for the others will be similar (except for skates, explained later). On the storyboard, add a standard “View Controller” scene. Click/select the ‘equipment categories’ scene. Create a segue, from the yellow view controller icon on this scene’s dock, to the new scene you just added. Set the segue identifier (to something like “toHelmetView”). Create a new UIViewController subclass, maybe named “HelmetView”. On the storyboard, match it to the scene you added in the previous step. Then, add and configure whatever user interface objects you need on the scene, and outlets for them in the controller. The controller will also need properties for 1) the Model object, 2) the Player object, and 3) the equipment item (i.e. Helmet object). You have a new scene and controller. Let’s make it show up. What do you need? 1. A method in the Model class that will fetch the data that you need. 2. Methods in the ‘equipment categories’ table view controller to handle the row tap / selection action. Add a new method to the Model class. Continuing the ‘helmet’ example from above, you can name to capture the ‘get helmet for player’ intention. The method will accept a Player object as a parameter. It will return a Helmet object. A standard ‘fetch request ‘ – an instance of NSFetchRequest – will fetch the specific helmet object for a specific player. 2., Or, you can fetch the Helmet object by looking in its “players” property (collection) to match the incoming Player argument. A user taps / selects a row. Handle that with the tableView:didSelectRowAtIndexPath: method. Code in this method is similar to what you’ve done before. The key task is to fetch the equipment item, using the new Model class method you added earlier. In the “HelmetView” controller, write code to set the outlet properties to the values in the incoming Helmet object. In the screen shot above, you see the “Change” button on the nav bar (right side). When a user taps that button, it will do the following. We will continue to use the ‘helmet’ equipment category. Show a table view controller, which will hold a list of helmets. This table view controller is embedded in a ‘navigation controller’, and presented using a modal segue. Use the Editor > Embed menu to help embed a controller in a navigation controller. This table view controller will be used as a ‘select list’, and not for navigation. Therefore, the presenting controller – “HelmetView” – will need to adopt a protocol, and implement a delegate method, etc. See the February 10 class notes page, and the “TVS Single” code example, for more. Each row in this table view will NOT have a standard disclosure accessory. However, it is possible that we’ll add a ‘detail disclosure’ accessory soon, to support info/detail drill-down. We suggest that you add a ‘cancel’ button to the left side of the nav bar, which allows the user to cancel the task. And for another task (described later), add an ‘add’ ( + ) button to the right side of the nav bar. The data will come from the web service. Therefore, you need Model class support for a collection of helmets from the web service. The data comes in asynchronously, so make sure that you update the table view when the data appears. Treat it like any other list-of-items-from-a-web-service task. 1. Fetch the object – which is an NSDictionary – from the array. 2. Pass back that object to the presenting controller, “HelmetView”. 3. In the delegate method, save the data from the selected helmet NSDictionary object as a “Helmet” object in the device store. At the end of the method, the presenting HelmetView scene will be visible. 4. Update the HelmetView visible properties with the new data. These instructions should help you make progress. From the previous section, when you’re viewing the list of helmets from the web service, your app will enable the user to add a new helmet. Present the ‘add/edit helmet’ controller modally (again, embedded in a navigation controller, so you can add ‘cancel’ and ‘save’ buttons). 1. Package it as an NSDictionary. 2. Pass back that object to the presenting controller, “HelmetList”. 3. In the delegate method, use a new Model class method to send it as a POST request to the web service. At the end of the method, the presenting HelmetList scene will be visible. 4. Update the HelmetList scene with the list that has the new helmet object. At that point, the user can select that new item if they wish, or do something else. In class, we discussed that every student will work with their own Team and Player objects. A personalized email will be sent to each student with this information. It includes the web service URLs used to get the data. If you can use this new information for the assignment part 2 (due tomorrow), then go ahead and use it. Otherwise, use it as soon as you can. Your current app creates a Team object and some Player objects in the store initializer class. Now, you will not create those objects in the store initializer. Go ahead and comment out those statements. Instead, you will initialize the app’s data in your Login class. Every student received a custom individual email message, with information about their team. Use the data about your own team and players. Visit the team URL by using the JSON Formatter & Validator. You will notice EMName and EMUsername properties. For example, …/team/26 is your professor’s team, the Utica Comets. John Forget is the equipment manager (EM), and his user name is john.forget. Next, visit the professor’s Authentication and Token service, and create an account for the equipment manager. YOU MUST use the exact user name that you see in YOUR team object. For example, the user name for your professor’s team is – as noted above – john.forget. You can use/create any password that you like and will remember. Then, you MUST use these credentials for the rest of the semester. As you will read below, the user names must match. This is a brief overview of the new startup sequence. It is more fully described below. It is diagrammed in the flowchart on the right. Click the image to see it full size in a new tab/window. The “startup” work will be done in the Login and Model classes. In the Model class, we need properties and methods to support the storage and fetching of Team and Player objects. In the Login class, gather the credentials, like before. If there is a Team object, compare the user name input with the “username” property of the Team object. If they match, can continue. If they do not match, display an error. If there is no Team object, it means that the app is being launched for the first time on the device. Continue. Login using the web service. Wait for the answer. Similar to the old way. If a authorization token is received, the login was successful. Continue. If there is a Team object, clean up after the login process, and segue to the player list. If there is no Team object, it means (as above) that the app is being launched for the first time on the device. Therefore, call the method (in the Model class) that fetches the Team object from the web service. 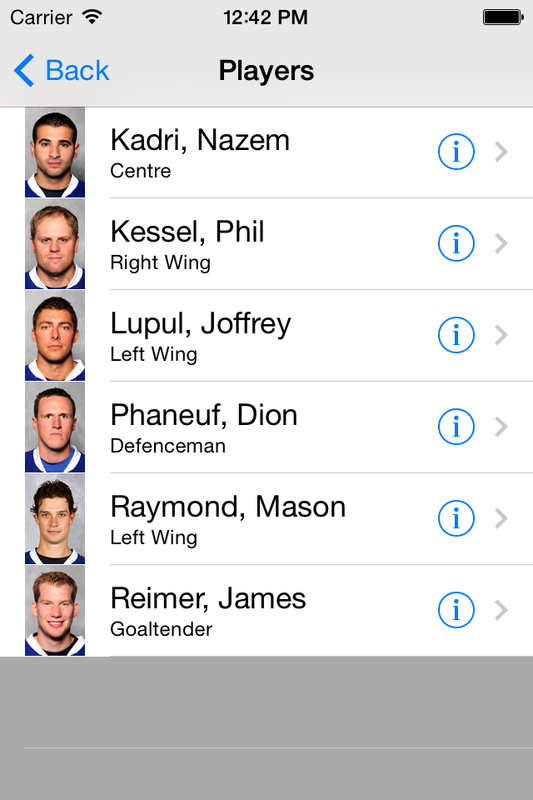 Then, clean up after the login process, and segue to the player list. The Model class method that fetches the Team object will complete its work, and then call another Model class method that fetches the Player objects for that team. Locate the first yellow-coloured process rectangle (titled “Login using the web service”). Create a WebServiceRequest object, and configure it with the URL of the authentication service, complete with the user name and password. Then, execute it. If you’ve designed your code correctly, the method that handles the notification message (that happens as a result of a successful login) runs. Locate the last blue-coloured decision diamond (titled “Team object exists?”). If the answer is “no”, it means that the app was just installed on the device, and we need to fetch the team and player data from the web service. That process is started by calling the Model class method “fetchTeamRequest”, which is described below. After the statement that calls the “fetchTeamRequest” method, segue to the player list scene. The list will be empty, but that’s OK. Why? The “fetchTeamRequest” method will send a request to the web service, and wait for the response. The request runs in the background, and after some time, the response – a Team object – will come back. Assuming it’s successful, its response handler save the Team data, and will then call the “fetchPlayersRequest” method, which sends another request to the web service. That request also runs in the background, and after some time, the response – a collection of Player objects – will come back. Its response handler will save the Player data. 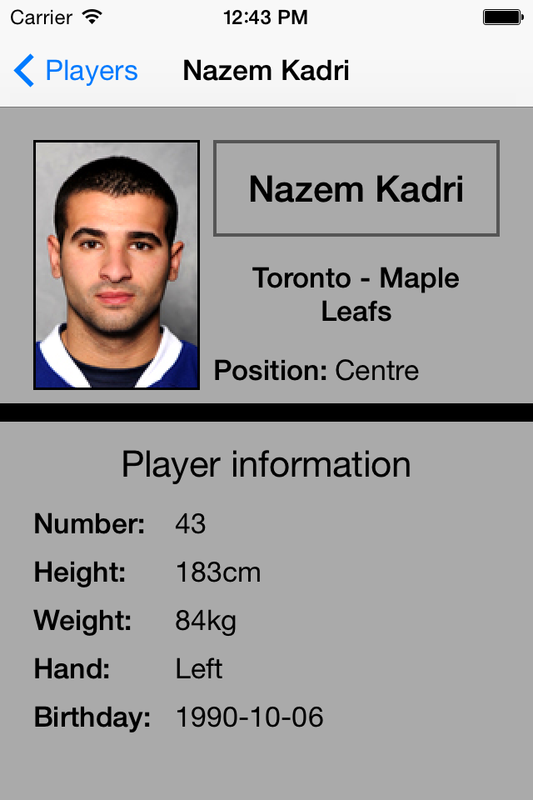 How does the Player data show up on the player list scene? Well, if you’ve done your job (fetched results controller for the Player data, a table view controller that implements the NSFetchedResultsControllerDelegate protocol, and implemented methods to reload the table view), then the Player data shows up auto-magically. Why? The first time the player list scene is rendered, there are no players. The fetched results controller’s fetchedObjects collection is empty, and you get an empty list. After the time-delayed background task completes, and the locally-stored Player objects get created, the fetched results controller will detect that it needs to be refreshed. Accepts one argument, which is the equipment manager’s user name. Void return type. Make sure the response comes back to the declared property “fetchedTeam”. Register the “fetchTeamResponse” method to handle the notification that’s generated by the WebServiceRequest object. From the JSON response data, use the “Item” key-value pair. Will be an NSDictionary. Does not need a custom getter. Its data will be set by the result of the “fetchTeamRequest” method. Similar design to other notification-handling methods that you’ve written. Void return type. Its first task will use the “fetchedTeam” data to create and save a Team object in the local store. Its second task will use the team identifier value, and call the “fetchPlayersRequest” method that’s described below. Accepts one argument, which is the Team object’s unique (web service) identifier. Void return type. Make sure the response comes back to the declared property “fetchedPlayers”. Register the “fetchPlayersResponse” method to handle the notification that’s generated by the WebServiceRequest object. From the JSON response data, use the “Collection” key-value pair. Will be an NSArray. Does not need a custom getter. Its data will be set by the result of the “fetchPlayersRequest” method. It will use the “fetchedPlayers” data to create and save Player objects in the local store.